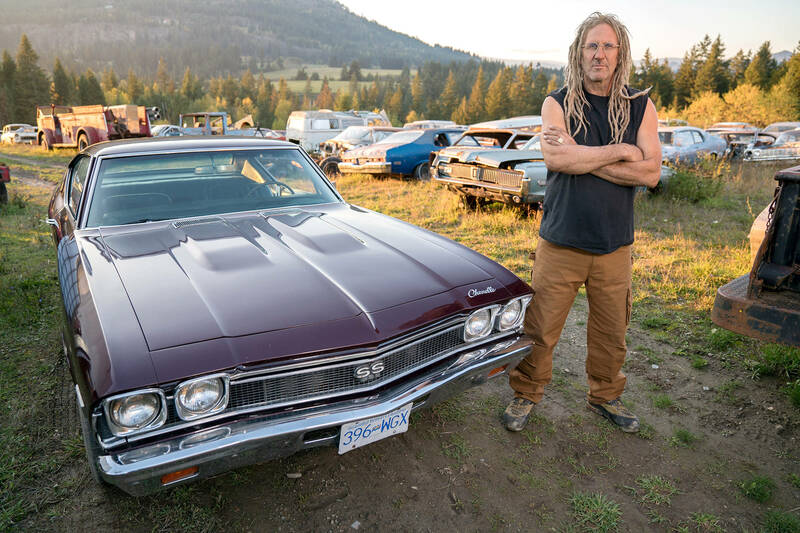 Nov. 30, 2018 2:30 p.m.
Nestled in the heart of the Shuswap in B.C.’s Interior lies a classic car lover’s dream: a sprawling collection of 400 iconic vehicles just waiting to be restored to their former glory as kings of the road. It’s the collection of Mike Hall, a resident of the small community of Tappen near Salmon Arm, and it’s set to make a debut on the small-screen as the focus of the History Channel television show Rust Valley Restorers. Mike Hall definitely stands out in the small community, getting his nickname, the “Rasta Blasta,” from his long blonde dreadlocks and his day-job blasting rock faces with explosives. His car collection ranges in condition from wrecked, rusted chassis housing valuable parts to near-mint collector’s pieces just needing a finishing touch. The cars are as varied in their condition as they are in make and model. Hall has been amassing this collection for 40 years, and has been looking for people interested in restorations to help offload some of the surplus. After making it public online that his massive collection was open for bidding, he soon found a flood of interest coming in which grabbed the attention of auto magazines and the online car community. Following this, the collection was documented by several publications in the car community, such as Roadkill. When a viral video snowballed the popularity of the car collection, the idea of a television show came up at the beginning of 2018. After close to eight months of filming between the day job – blasting rocks with dynamite, Rust Valley Restorers is set to premiere Dec. 6 on the History Channel. Now in semi-retirement, Mike is taking this chance to live out his dream of restoring classic cars while Connor focuses on the family business. While also featuring as a fixture on Rust Valley Restorers, Connor is also busy with the rock-blasting business. “My dad sits at home and plays with his cars and I go to work and make him the money to afford to do so,” Connor jokes. Some of the cars which feature on the show were restored for clients, while others were done out of a labour of love. Without spoiling anything too much, Mike noted they worked on everything from a 1940s-era Dodge Power Wagon to big block Chevelles, learning on the fly just how complex it was all going to be. Despite the huge size of the collection, both Mike and Connor can agree on something they would love to have to round out their collection: a 1957 to ‘67 split-window Corvette. And, while most of the collection is open for new owners, Mike stands firm on a few of his all-time favourites. The majority of the show is set in and around Tappen, and both Mike and Connor are happy to get the chance to showcase their community to the world, incorporating some of their friends and other local collectors into the mix as well. “I think it’s cool we are doing something here. You watch TV and all you see is these car shows in Las Vegas or California or down south in the U.S., but they don’t have anything in Canada,” Connor says. However, both Mike and Connor note that it’s tough to stay low-key about their latest project in the little town of Tappen. “I get called Hollywood about 10 times a day,” Connor says with a laugh. Rust Valley Restorers premieres Thursday, Dec. 6 at 10 p.m. PST on the History Channel.